This month marks the twenty-second anniversary of the completion of the fifth largest mosque in the world, the Hassan II Mosque. Located in Casablanca, it is considered one of King Hassan II’s crowning achievements. The master mind behind the elaborate $800 million dollar complex was architect Michel Pinseau, who met King Hassan when the king was visiting UNESCO headquarters in Paris. Pinseau had already contributed to Morocco’s cityscapes, and served as architect of many of the country’s royal residences, universities, social housing, administrative buildings and even an airport. Pinseau revealed his inspiration for the grand mosque project in a 1993 interview with the Moroccan daily L’Economiste, wherein he described his “two main sources of inspiration [as] the Koutoubia, the old part of the Hassan Mosque in Rabat and the Giralda in Seville.” Pinseau incorporated a Moorish style with modern characteristics into the building’s design. The zellige—an intricate diamond-patterned mosaic typical of Moroccan architecture—covers 100 thousand square feet. The majority of the materials for the designs came from Morocco, including 367,000 tons of marble extracted from quarries in the south for the walls and floors. Other materials used in construction were wood and plaster, the latter of which was incorporated into the columns, ceilings and peripheral walls of the prayer room by 1,500 artisans, part of a workforce of 35,000 craftsmen. Although the religious institution has the capacity to hold over one hundred thousand people for prayers, the mosque does not only serve as a place of worship. Visitors can explore a media center equipped with more than 100 computers with internet access. And the mosque offers cultural programs for adults, story time for children, and various other educational opportunities for the general public. Recognizing the importance of religious education, King Hassan II incorporated a religious school, the Medersa, into the mosque. If you’ve never been to the mosque, it’s certainly worth the trip. 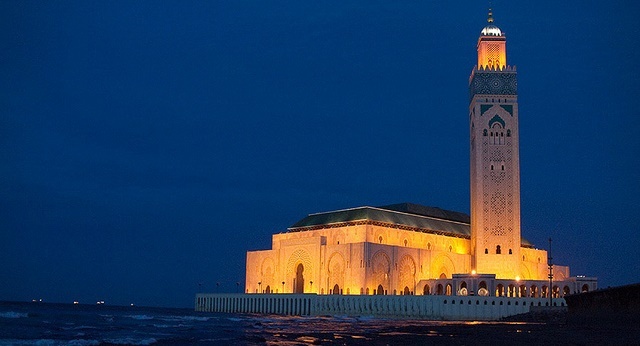 But if you’re not planning on being in Casablanca in the near future, you can also catch a glimpse of the mosque in the latest Mission Impossible film starring Tom Cruise! Robert Lalle is a Research Assistant at MAC.